The market is punishing the bank disproportionately for systematic risk. That's not good, but its better than being penalized for unsystematic risk -- especially for investors who understand the difference. Bank of America's headquarters in Charlotte, North Carolina. Image credit: iStock/Thinkstock. There are two types of risk that cause stocks to drop: systematic and unsystematic. Neither are good, but the latter is worse than the former. This is good news for shareholders of Bank of America (NYSE:BAC). Systematic risk relates to broad dangers that could cause all stocks to fall -- for example, negative news in the economy. This is what we're experiencing right now. 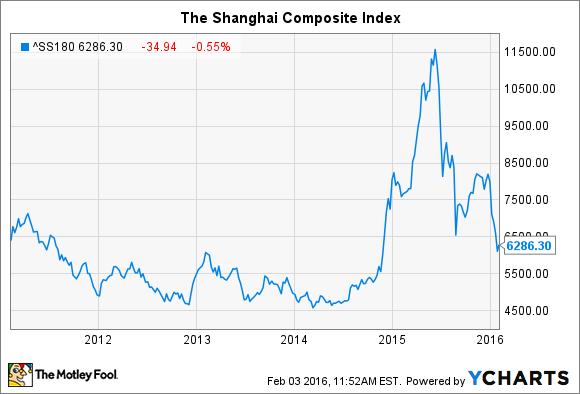 Investors are concerned about China. GDP growth in the East Asian country dropped to 6.9% last year. That's roughly twice the average annual growth rate of the United States economy since the end of World War II, but it's meaningfully below the nearly 10% average annual rate that China had become accustomed to over the past two decades. Fears of an economic slowdown in China caused shares there to plummet, with markets losing almost half of their value since the middle of 2015, including a sharp drop in January. Markets around the world reacted with declines of their own. It was this systematic shock, combined with concerns about oil prices staying "lower for longer," that caused shares of Bank of America -- and virtually every other major American company -- to decline over the past month. This isn't good news by any stretch of the imagination. Even though Bank of America looks to the United States for the lion's share of its revenue and assets, problems in China weigh on consumer and business confidence here, which, in turn, weigh on loan demand. The results of the Federal Reserve's latest senior loan officer survey suggest that this is already being felt. Demand for commercial loans among large- and medium-sized companies fell 11.1% in January. Yet, for Bank of America's shareholders, this is still better than the presence of unsystematic risk -- i.e., risk that's peculiar to a specific company or industry. It's this type of risk that has been the anchor dragging down Bank of America's stock since the financial crisis, which left it with an unprecedented amount of legal liability and loan losses. These have cost the bank upwards of $200 billion in the last eight years, according to its own estimates. If anything, in fact, Bank of America's unsystematic risk has declined since this time last year. A legal case wiped out $7.6 billion of its outstanding legal liability in the second quarter of 2015. The judicial decision also throttled the inflow of new legal claims from approximately $2 billion a quarter down to $200 million. Even Bank of America's debt rating has begun to recover, which will translate into a lower cost of funds and thus higher profits. Despite all of this, Bank of America's shares continue to trade for a measly 59% of book value compared to Wells Fargo's 43% premium to book value. Part of this is due to the $2.1 trillion bank's lagging profitability, which is still on the road to recovery, as evidenced by its 0.74% return on average assets. (A well-run bank consistently earns above 1%.) But much of it also stems from the systematic risk emanating from China that's impacting virtually every other company in America right now as well. That, however, will pass, and, in my opinion, opportunistic investors in Bank of America who understand that will benefit handsomely.